Hello all you Trad Fans! 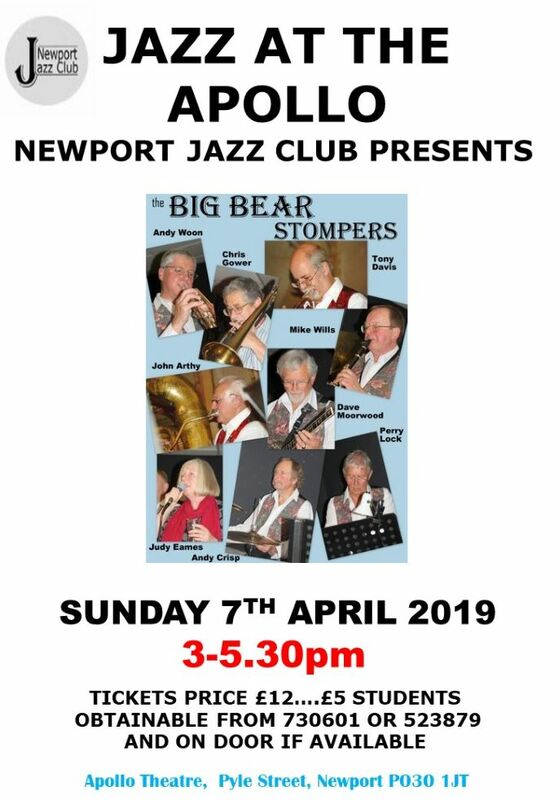 Our first Traditional Jazz concert of 2019 is by the Big Bear Stompers. This band is based on the style of Jazz made famous by the Lu Watters Yerba Buena San Francisco Jazz band of the late Forties when the jazz revival (those heady days!) was in full swing. The style, reminiscent of New Orleans marching bands, plus a singer, will be a driving concert not to be missed! On Sunday 7th April 2019 from 3pm to 5.30pm. Tickets £12 (£5 students) may be reserved by emailing W.G.Wills@hotmail.co.uk or Tel: 01983 523879 or 01983 730601 or on door if available. At this date we have already had bookings.